Shenzhen is the third graphic travel memoir I've read by Guy Delisle, and I think I may give up on him now. I just feel like he's not a very positive person (though he describes himself as an optimist in the book), and his unhappiness when he travels really seeps through the pages of his books. I enjoyed Burma Chronicles, but I thought he was kind of a jerk in Pyongyang. In Shenzhen, he's not really a jerk, but he just seems so unhappy to be in Shenzhen that I'm surprised he decided to write a book about his time there. So much of the time, he talks about wanting to leave the city and visit Hong Kong and Canton. 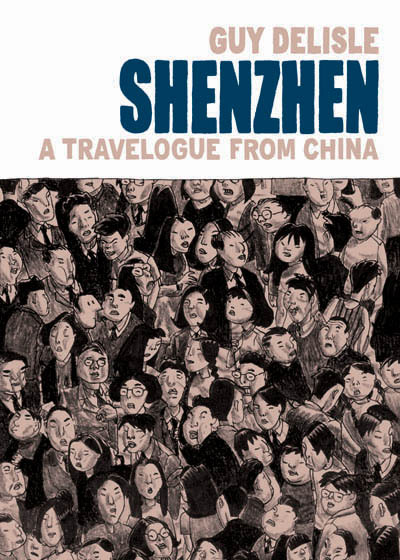 In fact, a good portion of the book is not about Shenzhen at all but about Delisle's weekend trips away. And he says he likes Hong Kong because he blends in there. I can imagine how exhausting it must be to spend months in a place where you are made to feel so completely different than everyone else. To not speak the language means that you really are quite isolated and can't make friends or go many places on your own. It's also hard to be the one white person in a sea of Asians (I assume), especially when people stare and point and all the rest that comes with the territory. But at the same time, Delisle could have used the opportunity to talk about that, rather than just saying he enjoyed Hong Kong because he could read the language and it felt more European. That made him seem like the sort of person who only wants to go to western Europe on trips, and I know that's not true as he's spent a significant amount of time in Asia. I just wish his desire to learn about other cultures and immerse himself in a different lifestyle would come out more in his books. That may not be what he wants to do, though. Delisle's strength is in his humorous anecdotes, his ability to take a small occasion and find the universality that exists there. He talks about how scared he was to ride a bike in Shenzhen, but then tells readers what the correct technique is (basically - just go forward with confidence and people will have to let you in). He talks about someone he works with telling a joke that was a huge hit with the office, but when Delisle asks someone to translate it for him, it makes no sense. But he laughs heartily, anyway. These moments really are fun to read about because I think all of us have been in that situation before, feeling very much away from home. But I think I would have appreciated those vignettes more if they hadn't been surrounded by commentary about Delisle not liking Shenzhen much at all. This is exactly how I felt about Pyongyang. I'd already given up on him; he seems to kind of focus on the obvious observations--his travel books are all about HIM, and I didn't like him very much. Hmm. I'm interested in the travel aspect, but I think I would find this frustrating. I spent part of a summer in China (Wujiang) where I was one of only fifteen Americans and one of only two African Americans who had ever been there. I was stared at constantly. But I had a blast being there. But I don't think I'd want to read a book where someone whines about being in China. I always think it's a very, very fine line when you're writing about a place that's not your home and where you don't feel at home. Bill Bryson falls into this trap too in Notes on a Small Island -- he gripes so much about it that I ended up feeling like, THEN GO BACK TO AMERICA IF YOU HATE IT SO MUCH, even though he obviously didn't hate England, just found some things about it frustrating.